For buildings with a history of ice dams with roofs that cannot be reached with a roof rake from the ground, consult a roofing contractor. Occupational Safety and Health Association (OSHA) regulations and standards should always be followed when working on a roof. Fall protection should always be implemented when working on a roof. Remove or relocate heat sources that are installed in open areas directly under the roof, such as an attic or mechanical room. 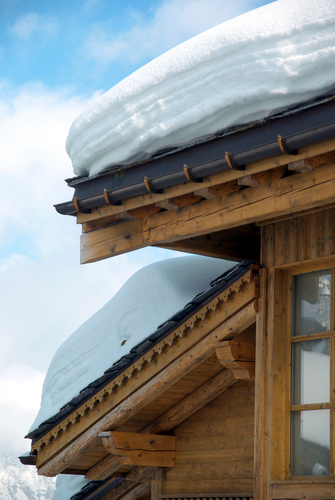 A warm attic melts snow on the roof, causing water to run down and refreeze at the roof’s edge where it’s cooler. INCREASE VENTILATION IN ATTIC SPACES. Soffit/ridge vents provide good ventilation for gable roof systems, however due to retrofit costs they are not always a practical solution for existing roofs. Gable end vents are not quite as effective as soffit/ridge venting, however they are cost effective. Electric fans can placed over the gable end vents to increase the flow of air. Box or static vents are practical improvements for hip roofs. Check to see if there is any visible light from recessed light fixtures in the attic. If there is visible light, they are not adequately sealed or insulated. Insulate or seal all attic penetrations such as partition walls, vents, plumbing stacks, electric and mechanical chases, and access doors. If the roof covering is going to be replaced in the near future, ensure that a sealed roof deck is installed using at least two layers of underlayment cemented together or a self-adhering polymer modified bitumen sheet (similar to underlayment).